Each week it feels like the video game industry is coming up with new ways to get you to pre-order games. Packaged bonuses, collectors' edition cases, limited edition figures, in-game items, early access to betas, and more. Today, Irrational Games announced new Steam pre-order incentives for their hotly anticipated action game BioShock Infinite. The rewards sound pretty good at first: "Pre-order BioShock Infinite on Steam today to help unlock exclusive rewards and free copies of BioShock and X-Com: Enemy Unknown!" Here's how it works: if enough people pre-order BioShock Infinite, a free copy of the original BioShock gets unlocked. If that's not enough, a series of exclusive BioShock Infinite-themed items (details below) in Team Fortress 2 will be unlocked if the number of pre-orders reaches the next level. Lastly, Steam will sweeten the pot by unlocking a free copy of X-Com: Enemy Unknown once pre-orders hit that magic number. Of course, this is in addition to the Industrial Revolution pack that you will receive immediate access to just for pre-ordering! In other words, they not only want you to pay them for their game before it comes out and anyone has had a chance to review it, they want you to act as marketers and encourage your friends to pre-order. Both of those bonus games are great, and make for outstanding pre-release rewards. Both are published by BioShock: Infinite's publisher 2K, which is doubtless why they're part of the deal. I'd take a free copy of XCOM—Kotaku's 2012 game of the year—over an in-game outfit or weapon any day. But surely I can't be the only who finds this whole racket sketchy. Look, pre-orders are bad enough on their own. They're entirely designed to help game publishers circumvent game reviews and get people locked into purchasing games before the press has a chance to tell the public whether the game is good or not. As Stephen so recently pointed out, the entire preview-to-preorder cycle is a challenging one for the press. 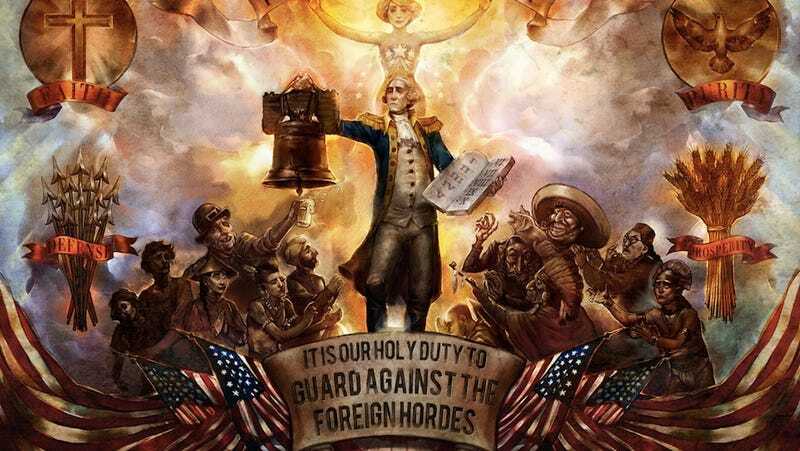 Previews of BioShock Infinite have been no different: Stephen was confident that the first four and a half hours of BioShock Infinite are good, since that's what he played. But none of us can say for certain how the next four and a half hours are, or how the finished game is. Of course we can't. We haven't played it. But the people selling this game don't care: They're perfectly happy for you to buy it right now, sight-unseen. With this method of pre-order incentivizing, 2K and Irrational have taken a bold step forward in manipulation. With this method of pre-order incentivizing, 2K and Irrational have taken a bold step forward in manipulation. I'm not sure if they're the first company to try this, but I've never quite seen anything quite like it, at least in video games. (Update: It's not the first: 2K has done something like this at least once before, with the initial release of XCOM last fall.) While a lot of people pre-ordering Infinite have likely already played BioShock, the more-recent XCOM remains something of a good get. So of course, it'll also require the most pre-orders to unlock. Further complicating the matter is the fact that this is for Steam only, meaning that these are "Steam Pre-Purchases," which work a bit differently than your run-of-the-mill GameStop preorder. If you preorder a game from GameStop, you aren't charged in full until you actually come down to the store and pick it up. If you wait for a day after the game launches, you can call in to the store and cancel. So if, say, you pre-ordered Aliens: Colonial Marines, then saw the terrible reviews, you could save yourself the purchase price. GameStop would keep the $5 deposit you put down, but as store credit—you could put it toward another game. But if you've pre-purchased on Steam, you can only get your money back if you contact Steam support before the launch date. After the game launches, you own it. "As with most downloadable software products, we do not offer refunds for purchases made through Steam," reads the Steam FAQ. "An exception is made for games purchased during a pre-order period if the request is received prior to the games' release date." So let's say that Infinite gets some negative or conflicted reviews, for whatever reason. It's not important why. You decide that you don't really want the game after all. If it's past the release date and you pre-purchased through Steam, you'll be out of luck. You'll own BioShock Infinite. I've asked Valve to confirm with me that you can only return pre-purchased games before the launch date, though I've no reason to believe that's not the case. I've also asked Irrational and 2K for some clarification regarding the finer points of this operation, specifically whether they'll be telling people who pre-order how close they are to unlocking the next target, or if those numbers will be hidden from customers. Lastly, I've asked what would happen if both BioShock and XCOM are unlocked but someone decides to subsequently cancel their preorder. Would they get to keep the two free games? It's unclear. I'll update if and when I hear back. "To unlock all these rewards, you'll need to spread the word and work as a team," Irrational's marketing copy says. "The more people who pre-order, the more rewards gets [sic] unlocked. Simple enough, right?" Sure, I guess it is pretty simple. Irrational, 2K and Valve want you to help them sell a game that hasn't come out yet. But for the time being, steer clear of this scheme. Pre-orders are bad enough—you don't have to take part in a viral marketing campaign, too. Update: Lots of discussion happening here, which is great. I wanted to note a couple of things. First of all (I put this in a comment, too): Several of you guys have pointed out that XCOM did a similar thing last fall, and that Tomb Raider is also currently doing tiered incentives on Steam. That's true, and I added a note to the article to make it clear that 2K has done this before. Though that doesn't make this kind of thing any less manipulative, it just means this isn't isolated. Also, a couple of people have said that it's self-important of me to suggest that pre-orders are designed to circumvent reviews. As if game reviews are so powerful! Sorry about that, I didn't intend to come off that way. Let me clarify: There are all sorts of "reviews." Once a game is out, people ask their friends whether it's good, they see what people they trust think of it—be they friends, professional critics, or message-board compatriots. That information can help make a decision as to whether or not to buy the game. Pre-orders let publishers get around all of that. It's in their interest to lock in your purchase as early as possible.